I really like how these colors look together and definitely feel they are colors from nature. I like the way the purse is lighter than the darks, but more a midtone and not a sharp contrast. Dear Readers, I never like rainy, grey days, but have to say when it happens on a Monday, it always feels worse…Not a good start for my mood…. I am grateful that my son was in his room reading and never heard the Fed Ex package arrive, so the surprise is solid. 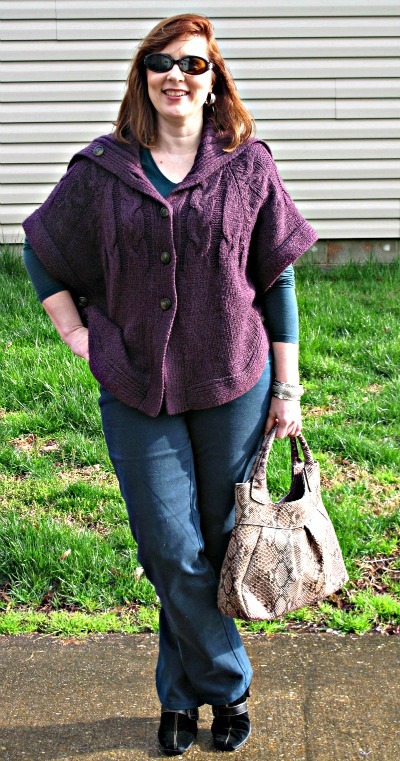 1 Response to "Evergreen & Plum"
I really love that snakeskin purse! I have a pair of snakeskin patterned flats and now I’ve thrifted a pretty gray/cream blouse in that pattern. I’ll be glad when it warms up more so I can wear it.